Benny's recovery won't be rushed | NUFC Blog. Good news as Newcastle United’s Hatem Ben Arfa – injured since the pre-season game against Sporting Kansas City – undergoes a light training session with the physio. Given our failure to recruit an additional striker, we have to hope that Best continues the way he’s been going and that Shola and Ba come good. Alternatively, we’ll be looking for goals from midfield and Hatem Ben Arfa could just be the man to come good for us in that respect. It’s good news then that he seems to be making his way back from injury and took part in his first training session yesterday. It was apparently only a ‘light exercise’ session (my equivalent of which is just lifting the one pint) but it gave physio Derek Wright a chance to assess the player. Apparently the club aren’t too keen to rush him back from this injury and I get the impression it’ll be October before we see him available for first-team selection. What I do wonder, though, is who makes way for him when he’s fit, assuming Ben Arfa is considered worthy of displacing someone else in the first place (and I suspect he might be). Tiote and Cabaye are, I think, fairly set for the central midfield roles, which probably means Ben Arfa playing left wing or right wing in a 4-4-2 or just off the striker in a 4-5-1. Benny prefers the left, so it could mean displacing Jonas, who himself can play on the right. So in a 4-4-2 that would leave Obertan, Lovenkrands and Jonas fighting out the right wing position, unless of course we play Obertan as an out and out striker (personally I don’t see him as that). I suspect – and I am only guessing – that Pardew would like to play Benny ‘in the hole’, which would probably mean Obertan or Lovenkrands making way. I don’t know, but at least there’s plenty of choice in our midfield even if we are possibly undermanned in other areas. Either way, I do hope Ben Arfa has just been unlucky with two successive injuries and is not going to become generally ‘injury prone’, which I can’t help but worry about sometimes. The lad promises much and I hope he gets a long injury-free spell to prove himself. It’s hard to believe he’s only actually played four times for us. Certainly not a Player you could build a team a round which is a shame because he looks great on his day and would add a new dimension to the side. How much time has he spent actually playing in a Toon Shirt? Also, if HBA is realistically at least a month away from playing, you’d have to play someone else there for now, like Obertan (RW) and then swap him in attack for Ameobie, Sammy or McLove. Unless u trial Marv at left wing, Jonas RW, Obertan as the 2nd st, and either Ba or Best as the big front man. I think with our plethora, or even ‘glut’, of midfield miestros, Pards will opt for a 4-2-3-1 in the coming month or so, while he tests out players and positions, in anticipation of HBA’s return, and Gosling also. Subs: Elliot, Tav, Willo, Raylor, Ferg, Sammy, Abeid, McLoven. *Failing the starting of Haris, perhaps Ba could play that role, and leave Best up front? He gets the spot taken up by a second striker atm for me. So just behind Best. Ba & an Ameobi on the bench for change up. I believe Pardew has said he wants to see Ben Arfa in the hole as his strengths are vision, ability to link play, create space and opportunities. I believe his deputy is Vuckic who has similar skills but not as finely tuned as Ben Arfa. I think Pardew might play Cabaye, Ben Arfa and Marveaux in the same formation as they have played together in France. On the right wing it would be either Jonas or Obertan both being direct runners. I think Best is the best of the group of strikers. He appears to be more mobile and has a better touch than the others. Shola is too static. Lovengrands doesn’t seem to have a lot to offer. For me, the jury is still out on Ba. A real shock to the system could be a Barcelona style setup with Ban Arfa and Marveaux up front with the ball always played on the ground, fairly radical but you never know. Can you imagine us playing like Barca…I love it! Not sure he’ll throw Marveaux in to that mix straight away though. I think he perhaps needs a bit more time. “I feel sorry for him. 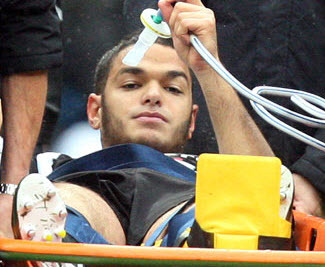 SJT, Ben Arfa was one of Ashley’s ‘Le Sulk’ misfits, not one of his injury questionmarks. He certainly wasn’t a sicknote before he came here. That De Jong bastad should have been flayed alive at the very least. worky, hopefully not blackpool style…or wigan, for that matter. But swansea have come up playing some really nice passing Barca style – tho that’ll probs mean that they’re rewarded with relegation. For all the troubles of the transfer window, i do think we’ll have some great passing moves as a team, and so long as besty can stay in form, he’s defo our top man for the job – “Knows where the goal is”. Ba will have to work hard and push on for that spot, but i think he’ll be a very useful addition. Just need to hope the passing doesnt get in the way of the goal scoring, and that some midfielder bang a few in themselves!! The more HBA is in the news for all the wrong reasons the more I’m annoyed by the FA. Scissor tackles should be banned out right. They should be an automatic 3 game ban, injury or not. De Jong should have been massively fined and suspened for months for that idiotic tackle. It’s clearly an intent to injure. I’m worried that he’s now a permanent sick note, his career ruined by that fat dutch tw@t. I hope that’s not the case, no one deserves to have their career ending by an aggro tackle like that. It’s criminal.